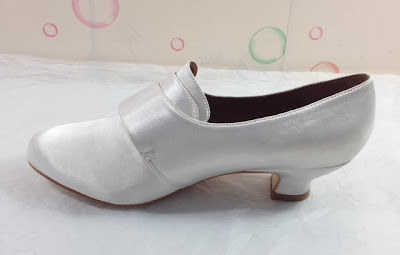 It took almost a year, but "Highbury" Regency flats, made of dyeable satin, are finally arriving in about a week and a half. 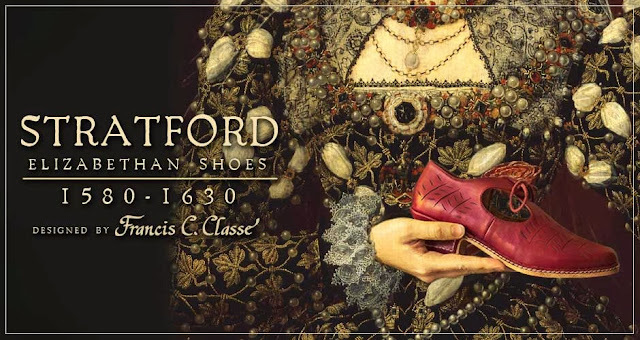 "Stratford" Elizabethan Shoes, which took a couple years to develop, are in production, arriving in March-ish. "Georgiana" - it's been years since we've had the dyeable 18th c. satin shoes. The new Georgies have the Kensington shape, leather soles and lining, and improved fit. 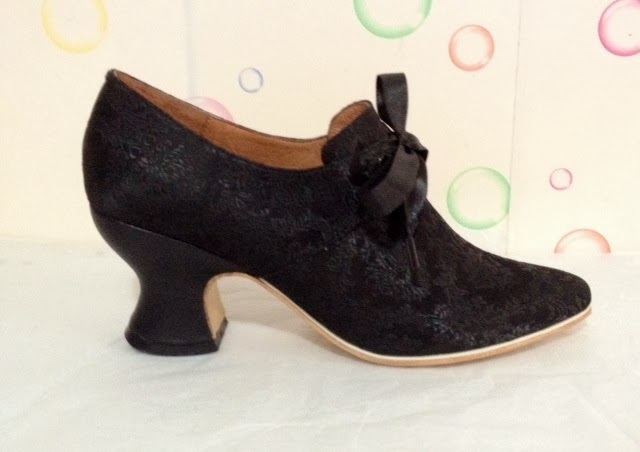 "Pompadour" in Black - following Pomps in ivory, the new black Pompadours have a revised toe shape, swankier fabric, and the lovely, historically accurate white rand. "Pemberley" - the 1790s staple returns with a pointier toe, higher vamp, and revised Italian heel shape. "Gettysburg" - side-lacing, leather and wool, foxed booties with square toes. These are adorable on, and work for the 1830s through 1860s. 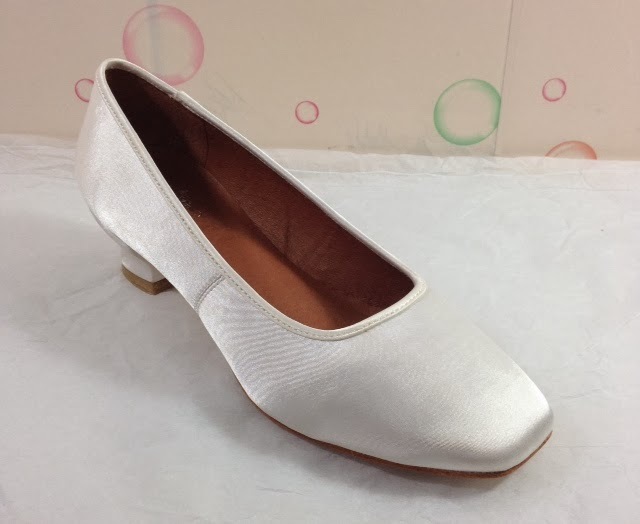 "Tissot" - the square-toed, low-heeled, dyeable satin staple of the Civil War ballroom. 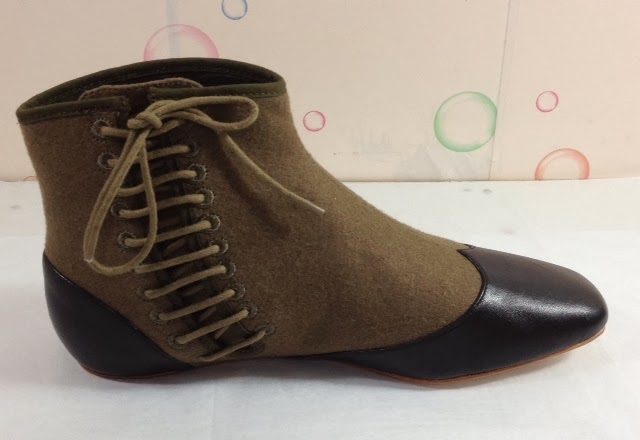 "Nankeen" - Regency fabric boots with soft toes and leather soles. 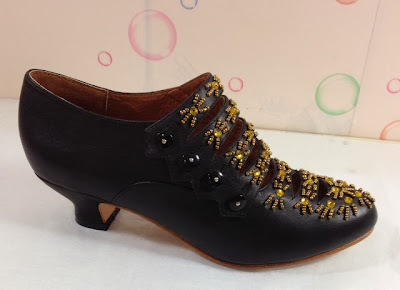 "Savoy" - heavily beaded Edwardian pumps with cutouts, and a low, comfortable French heel. We will also re-stock styles currently in the shop, and may add a new colorway here or there. Fabulous!!! My wallet is fearing for its life. I think that may be a splendid idea. :-) With the first run of anything we sometimes have to be more careful, but if something sells well, additional colorways are a good plan. Indeed! 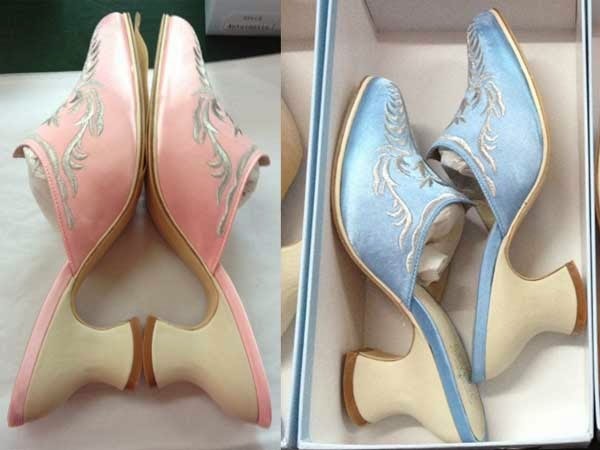 I'm pining for the pink Antoinettes...or blue? Ugh, I may just need both! Ahhh! 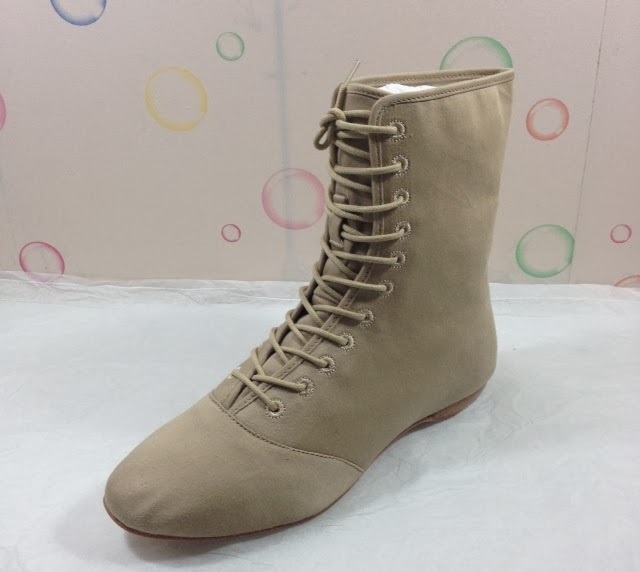 I love love love those side lacing boots!! Hartfields are already in my possession, muwhahahaha! YOU ARE SO AWESOME!!!! Seriously, I'm not a shoe junkie, although I love a stylish, comfy shoe--but all of these designs are just fantastic. Will Claremonts ever be released in another colorway? I desperately want a pair in black! Possibly - the black was as popular as the brown, just lost out by about 10 votes when we did the poll. I think a burgundy would also do really well. I'm with her -- really want the Claremonts in black! Oh yeah! Black or burgundy Claremonts would be awesome! Oo I love them all! 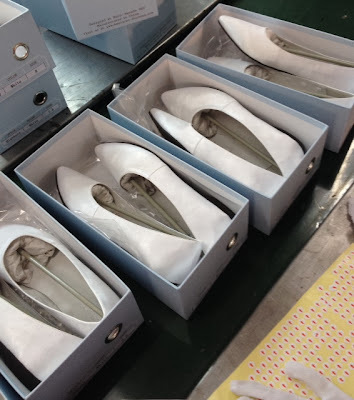 Thank you for bringing all these wonderful, historical shoes to life! Already saving up for a pair of Gettysburg's :) What colours are you planning, if any more than pictured? Gettys will come in the black/brown colorway only for the first run. If they do well, I'll consider doing some other color combinations in the future. "Renoir" button boots - 1860s through 1880s - Are these the scalloped Victorian boots you talked about earlier? I would like both black and white please. The Civil War styles have been a long time coming. There's a massive hole in our range that needs filling! Oh my goodness, how exciting! I see more than a few pairs of shoes I think I NEED this year. Truly exciting and great things you are making! Pemberley's pointier toes are more in line with the original shoes of the period, which had unbelievably pointed toes. That makes a lot of sense. *sigh* Oh, well, they're leather, so they're 99% perfect . . .
What kind/ how tall of a heel will "Renoir" have? Renoir and Tissot share a short 1.5 inch French heel made from an original. Please bring back size 12! I want your shoes! Oh wow, when I have a new job one day and can afford a proper Victorian and Edwardian wardrobe, I want so many of these! You are so talented! Give me them Gettysburg!!! Great work, Am-Duch! Spectacular! 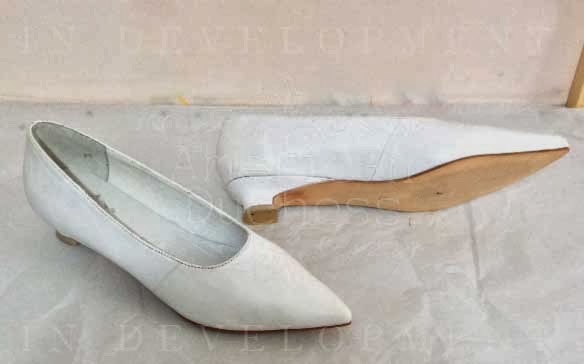 I love the idea that there's a leather 18th C shoe in the works, for those that will wear their shoes hard! Happy New Year, talented lady! YES! The pemberlies are back! All the shoes are gorgeous!